Here’s some news that Writers in the Schools (WITS) students can cheer about. And how great that the First Lady is standing up for poets and poetry! Students, dig deep and discover the poet laureate within you! 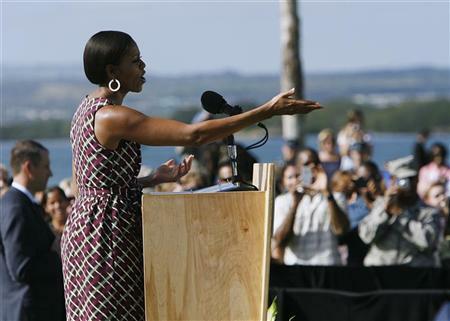 First Lady Michelle Obama on Monday helped launched a new arts program to pick five student poets from high schools who will spend one year promoting poetry through readings, workshops and other activities. The National Student Poets program is created by the President’s Committee on the Arts and Humanities, of which the first lady is honorary chair, and the Institute of Museum and Library Services through a partnership with nonprofit group, the Alliance for Young Artists & Writers. The five National Student Poets will be chosen from a pool of teenagers who have already received a national Scholastic Art & Writing Award for poetry. The selection panel will be comprised of poet Terrance Hayes, “Kenyon Review” editor David Lynn, Alice Quinn of the Poetry Society of America, and the Library of Congress’ Robert Casper. More than 185, 000 students apply annually for the Scholastic Art & Writing Award and since 1923, winners have included teenagers such as Truman Capote, Sylvia Plath, Joyce Carol Oates and others. The first five National Student Poets will be announced in summer 2012, and will each receive academic awards of $5,000. They will serve as literary ambassadors in their communities and encourage kids to develop writing and creative skills. “The National Student Poets work will give greater visibility to the voice and perspective of today’s youth,” said Virginia McEnerney, executive director of the Alliance for Young Artists & Writers. The President’s Committee on the Arts and Humanities focuses on increasing creativity in schools and engaging students in being innovative. The Institute of Museum and Library Services makes federal grants aimed at creating strong libraries and museums.